I found this recipe in my favorite cookbook, The Best of Mennonite Fellowship Meals, and tweaked it to my liking. Mix yeast and 2 cups whole wheat flour. Set aside. In large bowl, combine oats, 1/2 cup whole wheat flour, brown sugar, salt, and butter. Pour boiling water over mixture and mix well. Cool to lukewarm. Add flour/yeast mixture, and mix well. Gradually add additional flour, stirring with spoon, then kneading by hand. Let rise until double in bulk and punch down. Shape into two loaves and allow to rise again. 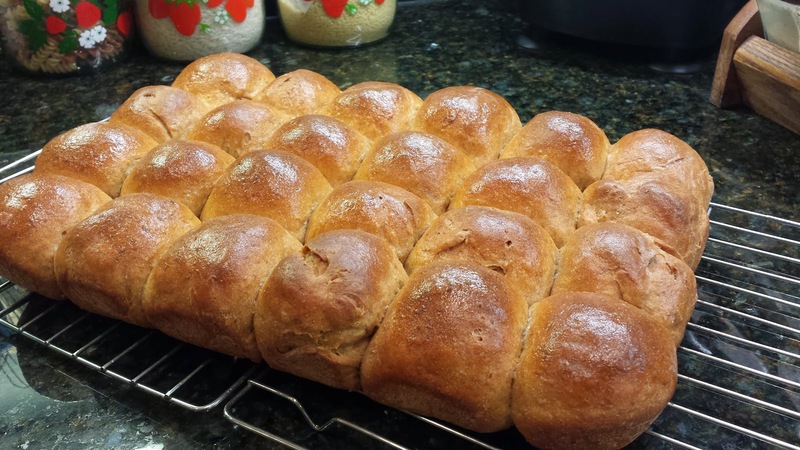 If making rolls, divide each half of dough into 12 pieces, form into rolls, and allow to rise. Bake at 350° for 40 minutes, or until done. Remove from oven, remove from pans, and brush tops with melted butter. Cool on wire racks. I usually make rolls instead of loaves of bread. The last time I made them, Cory said I should make them all the time. Combine 1 cup starter with 1/2 cup warm water and 1/2 cup whole wheat flour; let sit for an hour or two, overnight, whatever. Cook 1 cup Quick Oats as directed with 1-3/4 cups water; add brown sugar, butter, and salt to hot oats and let sit until cooled to lukewarm. Add to starter mix along with an additional 1/4 cup water and let sit again - an hour or so. Continue mixing as directed. Who needs packaged yeast? It may take a bit longer to rise, depending on room temperature, but it tastes just as good! YUM! !